4-time Asia Pacific Rally Champion (APRC) Cody Crocker shows that he is still the man to beat in this region when he triumphed in Malaysian Rally Championship (MRC) Round 2 at Chuping, Perlis. His victory was made even sweeter with the facts that he beats two big names along the way, APRC triple champion and 10-time MRC winner Karamjit Singh and current APRC title holder Katsu Taguchi of Japan. He was flying in his Subaru Impreza WRX STI right from the off, topping the timesheet in Day 1 with the fastest times in all six stages held on the first day. And he continues his form on Sunday, increasing his lead with another 12 seconds in the stage 7 and 8 before pacing himself to the finish line. Crocker finished the 122.49km rally events in 1 hour 17 minutes and 18.2s, 17.3s ahead of Karamjit in his old and trusted Mitsubishi Evo 8. This victory also relaunch Crocker’s bid for MRC overall title after a disastrous first stage retirement in Round 1 at Kota Tinggi. He is currently tied on first place in the the overall standing with last year’s champion Rafiq Udhaya of MRU Motorsports. Karamjit was trailing only 12 seconds in the first day, and was determined to topple Crocker towards the final six stages. But the Australian held on to the lead, delivering the ‘Flying Sikh’ first defeat in Perlis since 2007. Nevertheless it is still a good results for the veteran champion, who suffer similar fate as Crocker in the first round of the championship. Karamjit waiting his turn to start SS1 Kilang Gula. With 2 more rounds to go, one can never writes off the Malaysian multiple champion’s challenge for glory – as he seeks his 11th winner’s medal in MRC. Meanwhile defending champion Rafiq grabbed the final step of the podium in his Subaru Impreza. The principal driver of MRU Motorsports continues to deliver consistent podium finishes to joint-lead the championship standing. He was sitting comfortably in 4th place after Day 1, and rise one spot to 3rd on the penultimate day. This results was his second podium finishes in a row this season after he managed 2nd position in Kota Tinggi. It will be very tough for him to defend the title he won one year ago with three multiple APRC champion (Crocker, Karamjit and Taguchi) stands in his way. The trio competes under the Pennzoil GSR Racing Team banner this season, along with 5 other local teammate. Crocker’s car being fitted with new tyres for the next special stages. Finishing in 4th was Rafiq’s teammate Mike Ariokiasamy. He displayed a very strong performance in his Proton Satria 4WD, ended the race within touching distance of the podium. This results will surely boosts his confident for the remaining rounds in Negeri Sembilan and Melaka. Crews work frantically to prepare the cars at the Service Park. Mike rival in P11 category, Hafizy Hafiz crossed the line in 5th place – also in a Proton Satria. He will be disappointed to finish behind Mike, but will surely rebound for the next round to wrestle the P11 crown from Mike. 6th and 7th position was occupied by two others MRU Motorsports’s representative, Japan’s Aji Kim and Francis Keng respectively. Title favourite Taguchi was in line for a podium finish when his car suffered a mechanical problem at the start of Day 2. That dropped him down the pecking order and finally finished the rally in 20th place. 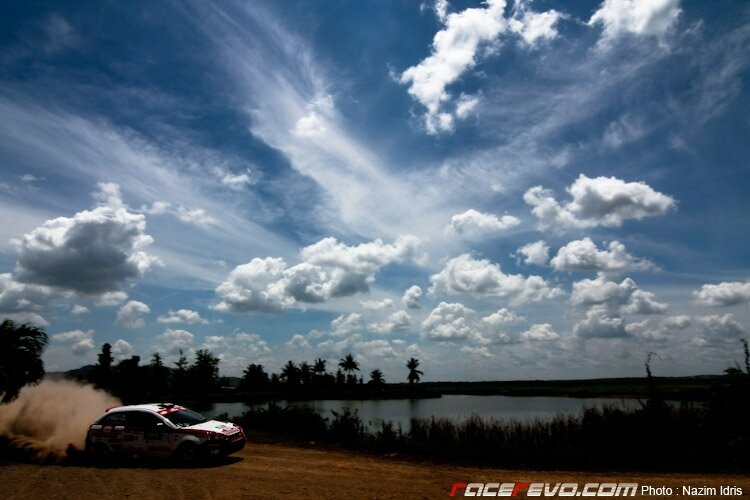 For FA Racing’s Faidzal Alang, luck certainly was not on his side as his engine broke down at the end of SS1. While another FA Racing driver Wan Mohd Hafiz completed the course to finish 12th. This year’s Rally of Perlis attracted quite a crowd, with local fans thronged the Chuping sugar cane plantation to show their supports for local rally drivers.